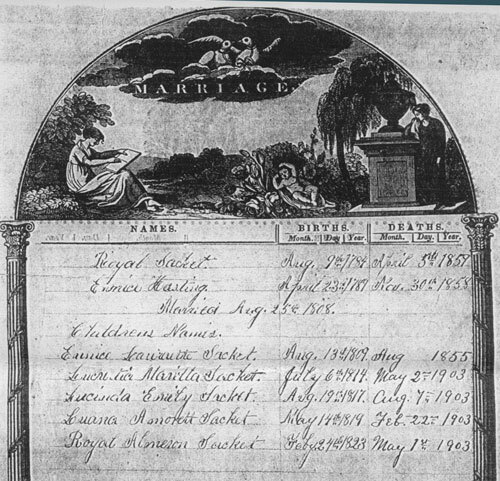 Royal Sacket born August 9th 1784 & Eunice Hasting born April 23rd 1789, married August 25th 1808. 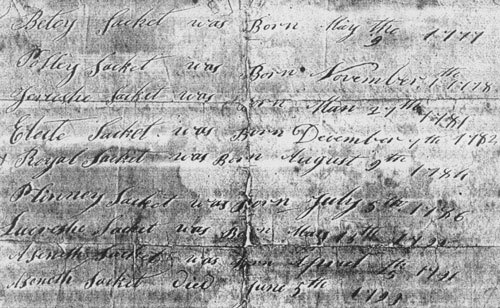 Royal Sacket, born August 9th 1784, died 5 Apr 1859, married 25 Aug 1808, Eunice Hasting, born April 23rd 1789, died 30 Nov 1858. Mrs. Emily Rising, widow of the late Alvin Rising of Southwick, died late yesterday afternoon at the home of her daughter, Mrs. O. A. Granger, at 23 Noble avenue. She had been in failing health for many years but had reached the advanced age of 86 years, death being due to a liver trouble, to attacks of which she had long been subject. The deceased was a native of Southwick, the daughter of Royal Sackett, one of the best known citizens of the town in his time. She was a devoted member of the Baptist church in that town and there she spent her married life. Upon the death of her husband, 22 years ago, she came to Westfield to live and had ever since made her home with Mrs. Granger. For many years the infirmities of age had passed heavily upon her, so that not for a long time had she been able to participate in any of the activities of life, yet to the last she retained her interest in church matters, and in everything that pertained to the best and true things of life. She is survived by one son, Henry D. Rising of Southwick, and by four daughters, who besides Mrs. Granger, are:—Mrs Ellen E. Rose of Suffield, Ct., Mrs. E. R. Osborne of this town, and Mrs. Alice Kellogg of Feeding Hills; also a daughter-in-law, Mrs. Estelle Rising of King Street. Mrs Rising was the last of her own family and it is a notable fact that she is the fourth of her brothers and sisters who have died in the five months since last February. They were:—Almeron Sackett of Milton, Mrs Enoch Root of Springfield, Mrs Emerett Jenkins of this town and now Mrs. Rising." "Sudden Death Of Mrs. Jacob Jenkins. Mrs. L. A. Jenkins, 83, widow of Jacob Jenkins, died suddenly yesterday afternoon about 4.30 at the home of her adopted daughter, Mrs. C. C. Freeland, 11 Fowler avenue. She had been in rather feeble health for some time, but of late she had been considerably better, and was up and about the house yesterday. She complained of not feeling well soon after 4, and seated herself in a chair. It was noticed that she was having a sinking spell and she passed away a few minutes later, seated in the chair, and before medical assistance could be summoned. Mrs Jenkins was born in Southwick, but had lived in Westfield for many years, where she was well known to the older residents of the town. She was one of the oldest members of the Central Baptist Church. The funeral arrangements will be announced later." 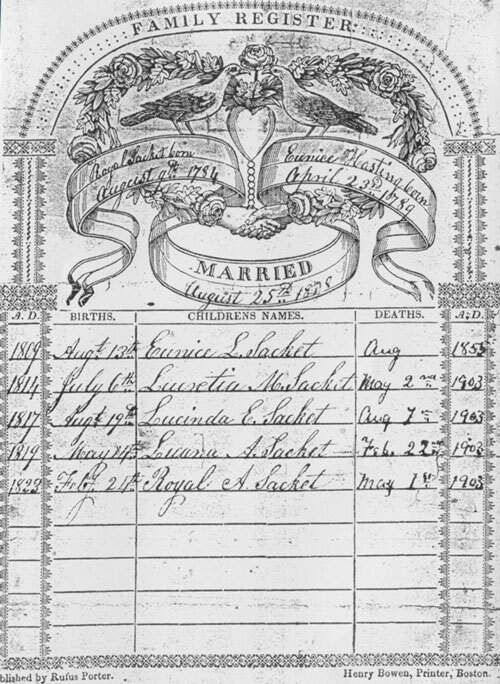 Enoch Root, born 8 Mar 1807, died 4 Feb 1872, married 24 Nov 1831, Lucretia Marilla Sacket, born 6 Jul 1814, died 2 May 1903. 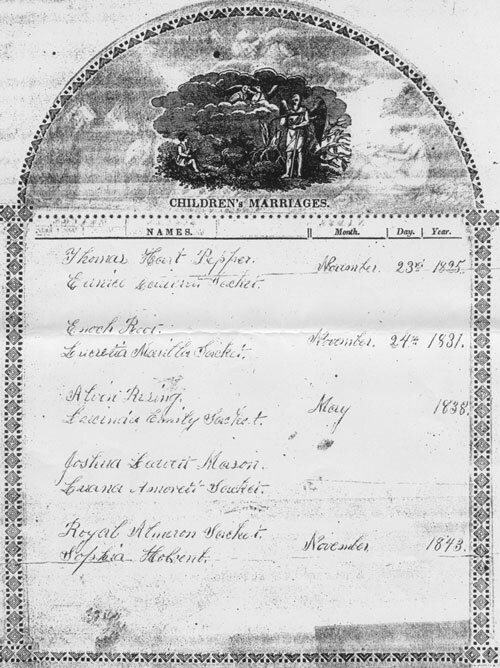 Charles B Grant married 25 Dec 1881 Sarah Adella Root. S. Adella Grant married Emerson Wood. Mrs. Lucretia M. Root, 88, died this morning at the City hospital where she had been ill for a long time. The funeral will be held Monday at the home of A. A. Tufts, 73 North street. Burial will be in Southwick." 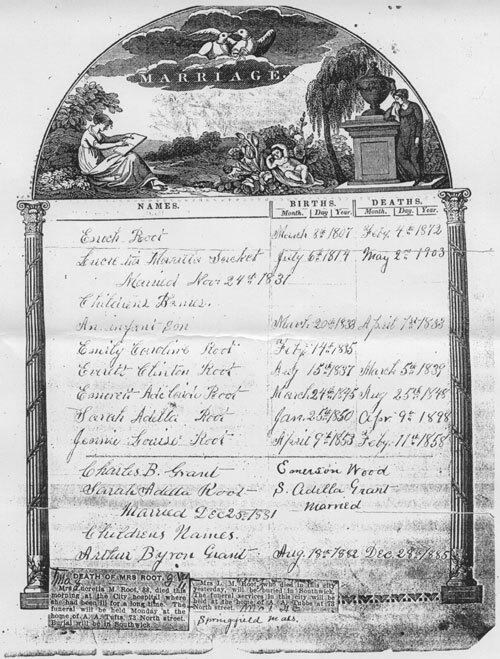 Royal Sackett (1784–1859), Family Bible Records. (Researched by Thurmon King).